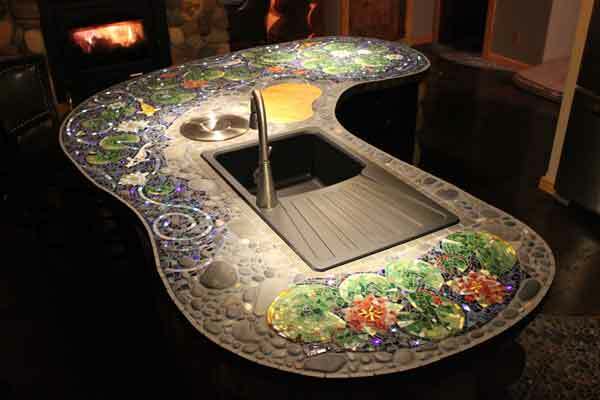 Recently artist Wendy Schroeder emailed us some photographs of her mixed-media mosaic bar top, and it is worth taking a look at for several reasons, especially if you are doing a high-end project and would like to integrate figurative mosaic art in a seamless way with other design elements. 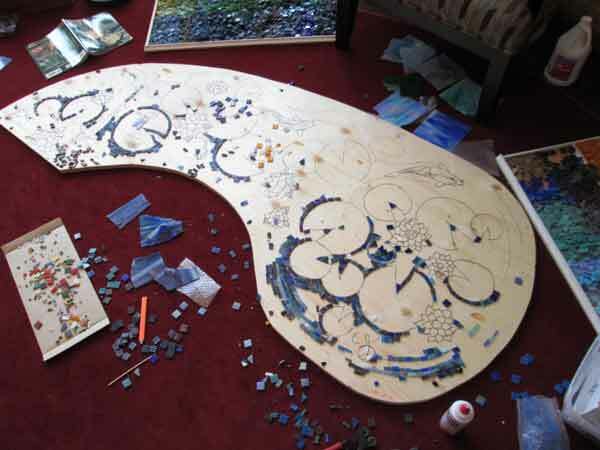 First, the glass tile mosaic part of the bar top is a strong figurative design (koi pond with lily pads and lotus) that makes good use of contrasting colors from the color wheel. Wendy also made good use of multiple shades of the same hue to make color fields more interesting. (She used multiple greens for the lily pads and multiple blues for the water instead of just one color for each.) There is also good use of andamento, which is the practice of arranging the tile in curved concentric rows to suggest motion instead of placing the tile in straight rows or grids. 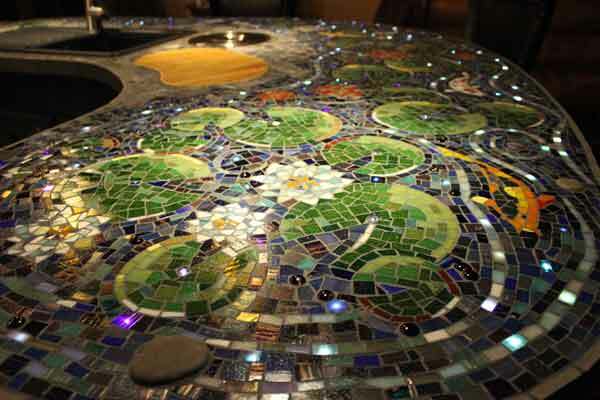 This impressive mosaic bar by artist Wendy Schroeder has a strong figurative design for the glass tile mosaic portion, which is integrated with the other materials and features making up the bar. Notice how well the rounded river stone mosaic works with the glass tile mosaic in spite of being different in texture and color and how the river stone mosaic helps tie in the sink and draining board. Also note the use of thick stone tile to make a border and cover the side edges of the bar top. Another reason this project was successful is that the glass tile mosaic koi pond is well integrated with the other features and elements making up the bar. A second type of mosaic made from monochromatic rounded river stones contrasts the color and texture of the glass mosaic, and it helps tie in the black sink and draining board. 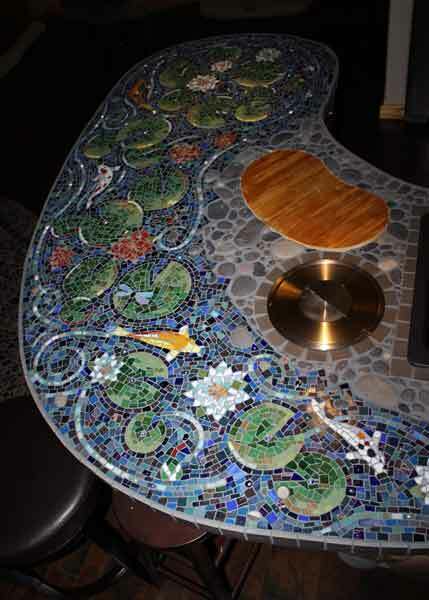 Sure the entire bar top could have been covered with the mosaic of the koi pond, but having less of it and having it paired with a contrasting dark material make its colors stand out more. Wendy’s use of the stone mosaic to limit the amount of colorful glass mosaic is a convincing demonstration of how less can be more in art, and it makes good practical sense too. Pots and pans can be dropped on stone mosaic around the sink instead of on brittle glass tile. Besides, I’m not sure the glass mosaic would have looked as strong if it ran all the way to the sink. It may have looked more like a generic repeating covering purchased by the square foot if it had been used to cover the entire bar top. The irregularly shaped intersection with the river stone mosaic calls attention to the custom aspects of the design. 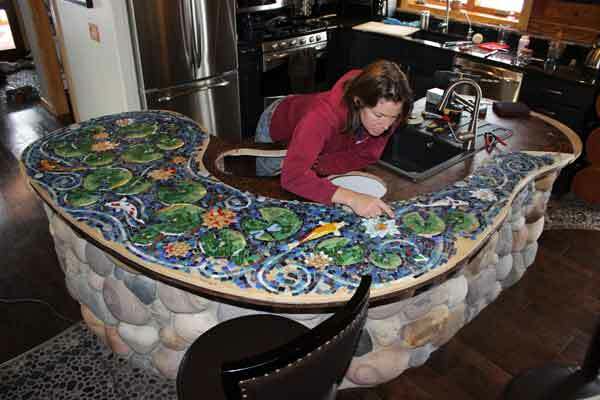 The artist Wendy Schroeder working on her mosaic bar top. Note that the rounded river stone mosaic is yet to be installed around the sink as are the thick stone tiles used to cover the edge of the bar top. The photograph gives a good overview of the figurative elements. Note the abstract swirls running between the lily pads. The abstract swirl illustrates how curving andamento can be used to interact with figures in a mosaic design. The large boulder construction of the body of the bar underneath helps tie the mosaic bar to the same materials used elsewhere in the cabin. Third, Wendy’s mosaic bar top has a great solution for the side edges. Instead of tiling it with small glass mosaic, thick stone tiles were used in a way where the tiles extend up to form a border around the mosaic on the top surface. You need to look closely at the first and third photographs to see these border tiles, and only their top edges are visible in the first photo. Note how those tiles have to be as thick as they are to properly form a border around the black river stone mosaic. A walnut cutting board and brass bin cover are built into the mosaic bar top. Note the thick stone tile used to cover the side edges of the bar top and how these stone tiles form a border around the glass mosaic. The photograph above shows how a walnut cutting board and brass bin cover were integrated into the mosaic design of the counter top. The thick boarder tiles used to line the edge of the counter top are also used to form a boarder around the sink and brass bin cover. This boarder helps tie all the different components together. What is equally important to me is how the bar counter top as a whole works with the other design elements in the room. After all, the colors and the materials and the design of the mosaic shouldn’t look out of place in the room where it is being installed. Otherwise it doesn’t matter how well the mosaic itself is executed. Usually this sort of harmony is achieved by using similar colors or materials or motifs or themes in the mosaic. The hardwood floors and stone mosaic used elsewhere in the kitchen help the bar to look “at home” because they are similar in color and texture and design and theme to the bar. Even the modern stainless steel appliances are visually compatible with the bar top because it contains black and gray elements. From what I have seen over the years, architectural mosaic projects that fail usually do so because the materials or colors or design of the mosaic are not compatible with the decor of the room as a whole. It means a lot for me to say that because I am a figurative artist who paints and mosaics for its own sake, and I hate the idea of shallow people buying a painting merely because it matches their sofa, but art is context and art is design. Things have to be balanced and compatible as a whole in terms of interior design for the artwork itself to be fully appreciated. Another reason I wanted to show off this project is that Wendy got some good photographs of the work in progress, which is something I have been terrible about doing, at least in the past. 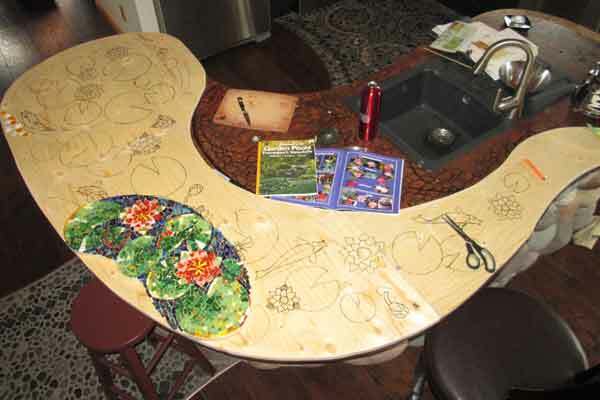 One of her work-in-process photos shows how she drew her cartoon (pattern or outline) directly on the backer used for the mosaic counter top, which in this case is a plywood surface with some reinforcing underneath. 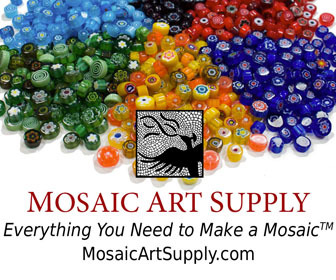 The outlined patterns used for creating mosaic designs are referred to as “cartoons,” and these can be drawn directly on the backer to be mosaiced if the surface isn’t currently in use. Usually you have to lay up the mosaic design in advance on mounting tape or mounting paper or fiberglass mesh because the surface to be covered is being used during the time it takes to lay up the design. Mounting tile on a large project is a time consuming process that ties up real estate in your studio for an extended period. It isn’t practical to pick up and store everything after each working session, so it makes sense to find a room or work surface that can be occupied for the length of the project. All that being said, small mosaic plaques can be made quite easily on a shared table provided you vacuum after work sessions and keep materials stored in trays. Custom figurative mosaic work with glass tile means a lot of cutting, which is easy to do with a mosaic glass cutter, but tiny glass slivers are produced. These can be quite sharp and lie hidden on surfaces until you rub your hand over them. Keep your vacuum handy and cut over an old towel to contain these sharp slivers. Make sure you retire the towel after use or use it exclusively for mosaic. Thanks Wendy! I really enjoyed showing off your project. This entry was posted in Art Review, Inspiration and tagged contemporary mosaic, fun project, large mosaic, nature on November 18, 2014 by Joe Moorman. This is absolutely stunning!! Way to Go Wendy!! Beautiful work !!!!! I’m just getting into doing mosaic … I’m so intrigued by it…. Great job !!!!!! So impressive. Thank you for sharing.